Output Management Engine PLOSSYS 4.5.3. The newest release of our output management engine is PLOSSYS 4.5.3., with many new functions and features which we’ll discuss in detail below. PLOSSYS 4.5.3. is the continuation of a tradition established in previous releases: even more secure, more robust, more efficient. It’s available immediately in new installations and updates. A secure data transmission has been possible with PLOSSYS for many years. Until now, this was activated only if needed. We’ve made encrypted data transmission now a default setting in keeping with our customers’changing security requirements. We’ve also used this opportunity to update the encryption protocol used, from TLS 1.1. to TLS 1.2. We’ve augmented PDF processing with PLOSSYS 4.5.3. in two ways. First, you can now also work with very large PDF files (> 2GB). Second, it’s now possible to generate additional PDF/A-2 in electronic output. For large PLOSSYS installations – for example with many different output servers – it is currently customary to implement a centralized management server. Different environments are managed more easily this way. To keep this centralized service from becoming a single point of failure, it can now be operated absolutely securely with PLOSSYS 4.5.3; for example if it is installed on an HA cluster with a failsafe file system. This provides highest reliability, even in a dispersed system landscape. PLOSSYS has long been using trusted DPF conversion processes, if a customer wants to print application formats, for example from Office files like WORD, EXCEL or PowerPoint. Up to now, these conversion processes were carried out synchronously. This could lead to all converters suddenly waiting on the result of DPF conversions, especially if, for example, a large CAD assembly is being printed. Other output processes would then no longer be possible. To prevent this, the DPF were linked asynchronously with PLOSSYS. This means that PLOSSYS gives the conversion to the DPF and then releases the converter again. In the case of a large assembly output from CAD or a bulk processing of Office documents, it’s now possible to also handle other conversion and output processes parallel to the application conversion. We’ve adjusted the architecture of Pickup-Printings with PLOSSYS 4.5.3. so that there is now a centralized pick-up server (management server). References for all pick up orders are collected there centrally. If a user has authorization at the printer, the integrated pickup printing solution (currently the CDDS solution from Genius Bytes and Streamline fromRicoh) must no longer ask every PLOSSYS server whether there are orders for the identified user, but rather it asks directly in the central pick-up server. In large environments with 30 or 40 servers, this leads to a significantly reduced waiting period for the user. The actual printing is still carried out by the server where the pick-up job originally landed. If this server doesn’t recognize the printer, it redirects the order to the PLOSSYS IPP router. This forwards the order automatically to a PLOSSYS serveron which the desired printer is configured for the job. The release of PLOSSYS 4.5.3. was joined by the releases of easyPRIMA 1.2.7., OCON 1.5.3. and SEAL Master Driver 7. In easyPRIMA 1.2.7. we have improved Windows and SAP integration and installed additional configuration parameters, among other things. The REST interface was expanded and improved so that easyPRIMA can be integrated even better with external systems. Finally, we added data fields over which to operate the PLOSSYS rules engine RUMAN (Rules Manager). OCON 1.5.3. has now been released for Windows 10. Here too,we have adapted the communication between OCON and the configuration database in such a way that this now takes place with encryption. The SEAL Master Driver has been given a facelift in Version 7, as we not only enhanced the standard Microsoft interface with additional print options, but rather we redesigned the entire user interface. TheVersion 7 Master Driver is Microsoft-certified and available immediately. The new Master Driver furthermore allows for the use of another new PLOSSYS 4.5.3. function: booklet printing. With PLOSSYS 4.5.3. this takes place completely within the output management, independent of the application. You can therefore use booklet printing not only from Windows, but also from any other application that can set the corresponding order parameters. What’s even more important is that we have booklet printing completely within our control. Do you have questions about PLOSSYS 4.5.3? Just fill in this little form and we will get in touch with you! Please let me introduce myself, I’m Fouad KASSI, Xerox Morocco system analyst. We have some issues between Sealsystems & Xerox D95. When printing using SAP, a Plan is printed in portrait instead of landscape. thank you very much for your comment! Our experts will get in touch with you immediately. Sorry for the delay, this was due to the Christmas holidays. 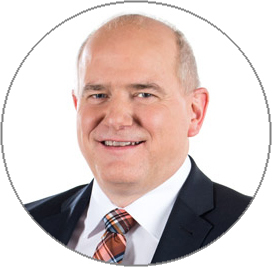 Johannes Hesel has been with SEAL Systems for over 25 years, and he’s been working with output management for just as long. He has played an important role in the development of our output management platforms, from plot management to document output management to today’s corporate output management. When time allows after work and family, he enjoys riding his motorcycle or his tractor.